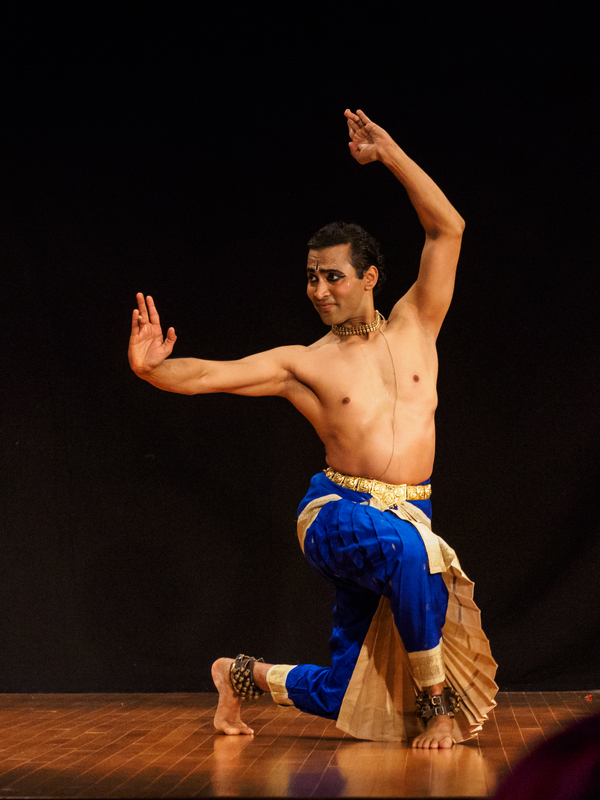 Nadhi Thekkek and Ganesh Vasudeva, both Bharatanatyam artists in the Bay Area, presented Hari Hara at Shirdi Sai Parivar, Milpitas, California, on April 2, 2016. Given the title, it was a bit disappointing when it became apparent that Nadhi and Ganesh would be dancing separately. However, the above-average performances by both certainly made up for it. Nadhi started with a crisp Simhendramadhyamam-adi Pushpanjali marked by clean bodylines and unfettered choreography by A. Lakshmanaswamy. Some of the steps were on her toes, which was a novelty. There was neutrality in her expression though; a little more involvement would have made a good presentation great. The varnam Innum En Manam was next. Nadhi’s nayika was an idealist; quiet, with a high threshold of tolerance. So when she asked, “Is it fair that you ignore me?” she was not angry or desperate. It was asked with a sense of entitlement, almost as if she was trying to figure out what else she could have done to ensure an audience with Krishna. Again, A. Lakshmanswamy’s no-frill choreography shone here and blended particularly well with Nadhi’s own minimalist style. Or was the choreography that veneered Nadhi’s execution? – one could not tell where the inspiration ended and the presentation began. The first set of padartha was masterful; each repeated word had a distinct depiction. The character portrayals were not heavy-handed at all: Krishna shifted into nayika with a light touch but this was clearly discernible; with intelligent use of tilt-of-body and outstretched foot (front tilt for a nayika in longing, back-tilt with out-stretched foot to show Krishna holding back). The quality of music felt like a live orchestra. Nadhi’s Hari was a showcase of A. Lakshmanswamy’s choreography and her own talent as a dancer. Overall, the only cautionary comment to be made is the overuse of broad smiles, as it detracts from the narrative. For the next hour, Ganesh Vasudeva manifested Hara in compositions emphasizing truth, beauty, devotion, and love. His sthayi personality contrasted with Nadhi’s nayika: His was a Lord who held little back, hers was a nayika in self-imposed restraint. Ganesh’s first piece was Paramananda Natana in Kedara –adi by Swati Thirunal. It was his own choreography, and lived up to the quality one has come to expect from him. It was balanced in that it leveraged upper and lower body, abhinaya and nritta, brevity and sanchari. The depiction of the lotus with a long stem that emanated at the navel and morphed into the curves of Shiva’s eye was particularly memorable. Ganesh’s heroine was not overly effeminate, and he always sprang back to his own self during the nritta or when depicting the lord. Ganesh’s jathis were crisp – as usual, one got to see unique ways to incorporate alapadmakaha and katakamukhaha combinations. There was one jathi where the emphasis was on the use of patakas which appealingly turned into dola-hastas. Overall, if a comparison were to be made, however unfair it is to do so, between his original thematic Bharata, and this performance, one felt he had been able to completely surrender to the art and to the Divine in the former, he came close to it in the latter.